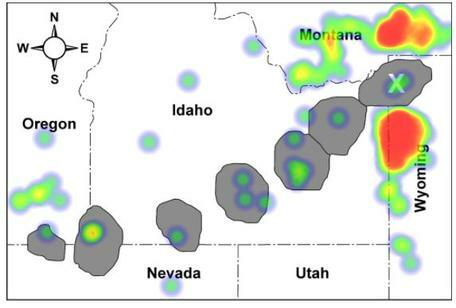 A heat map of students responses to the question, "The tectonic plate moved Southwest over the hot spot. Click where you expect the next hot spot will form if the plate started moving North." Drs. Nicole LaDue and Tim Shipley published a paper in the Journal of Science Education and Technology on the use of click-on-diagram (COD) questions, administered using a classroom response system (CRS), as a research tool for identifying spatial misconceptions. The COD data confirmed known misconceptions about Earth's structure, geologic time, and base level and revealed a novel robust misconception about hot spot formation. Questions with complex spatial attributes were less likely to change following instruction and therefore were classified as indicating a robust misconception. COD questions provide efficient access to students' conceptual understanding and can be administered with most modern web-based clicker (CRS) services, including polleverywhere.com, which has this question type as an option for its free service. CRS-administered COD questions present an opportunity to gather spatial conceptions with large groups of students, immediately, building the knowledge base about students' misconceptions and providing feedback to guide instruction.